Leaky gut syndrome is a serious condition that’s estimated to be affecting millions of people all over the world. It’s a condition that’s often unnoticeable and many people don’t even realise that they have it. Many countries have a medical industry that doesn’t even recognise leaky gut syndrome as a valid condition. The truth is that this sort of condition is very real and has a wide number of debilitating syndromes that can have a devastating impact on an individual’s quality of life. 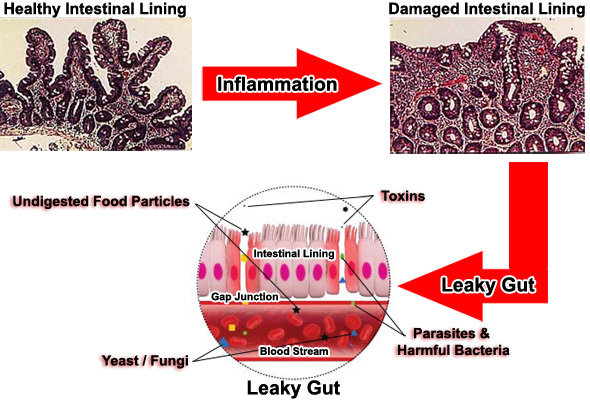 Leaky gut syndrome is the inflammation of the intestinal walls that can affect the absorption of vital nutrients, such as glucose, through the villi and microvilli, which are small protruding hair like structures that increase the surface area for improving the retention of the nutrients that are broken down and extracted by the digestive system. It usually arises as a result of candida as these walls will then become weaker if too much of the substance is present. When somebody has this problem these become inflamed, and are thus damaged or altered in an adverse way. The reason why it causes so many problems is because the secretions produced by the enzymes that break down the food into the nutrients that the body needs are altered so this can’t happen any longer. Once this happens, the liver and the immune system come under attack as the toxic molecules that the intestines normally keep out are able to break through the weakened intestinal walls. The body’s defensive systems are then called into action and can often be overwhelmed. There are a wide variety of different symptoms that are connected in some way with this syndrome. Part of the problem is that there are so many symptoms that they could be connected to other illnesses, and that’s also part of the reason why some doctors will often fail to spot when this sort of problem is present within a patient. The most obvious side effect of developing this sort of issue is going to be fatigue. Due to the fact that the intestinal walls aren’t absorbing what it needs it means that the body isn’t getting the energy that it requires to carry out its daily activities. Eventually, this can develop into the more serious form of chronic fatigue. Another of the most common symptoms is a weakened immune system. Patients are often confused as a result of this symptom as the illnesses that are let in as a result of a weakened immune system can mean that the actual illness isn’t attributed to its parent problem of leaky gut syndrome. Just some of the issues associated with this syndrome are listed below. By no means is this an exhaustive list. As already mentioned, going to a doctor could be difficult due to the fact that a lot of doctors won’t even acknowledge that the condition exists. The good news is that patients can test for this themselves at home. Below are just some of the ways in which leaky gut syndrome can be tested for. The same as above, this is by no means an exhaustive list. The most common way is to utilise a solution of lactulose and mannitol and to collect the urine for six hours. High levels of both of these substances after the urine has been tested indicates that the syndrome is present, although low levels can also indicate it as it demonstrates that a lack of digestive absorption is present. A stool sample can be taken to see exactly how well fats, proteins, and various other important nutrients are being absorbed by the body. A sign of dysfunction is of infections, a significant amount of intestinal bacteria, and a candida presence. People who suffer from the problem of leaky gut syndrome could find themselves in even more trouble as other diseases can be caused as a direct result; mainly from the symptoms that arise as part of this condition. The below list just provides a snapshot for some of the other diseases and conditions that can develop. The main reason why this problem develops in the first place is because of a poor diet. The toxins and the chemicals that are present within so many bad diets is what alters and transforms the villi and the microvilli on the intestinal walls in the first place. Naturally, the only real way to start eliminating the problem is to concentrate on the problem of poor diet. Most modern foods, especially those that come from fast food restaurants, are filled to the brim with chemicals, additives, and other nasty substances that the body just wasn’t designed to cope with. The pH level of the intestines is acidic, but if this is thrown out of its normal orientation then the cells present within the gut will begin to change for the worse. That’s the essence of leaky gut syndrome and is why those who eat extremely acidic diets will often suffer from this condition. Foods that are high in fibre can help the body to deal with the syndrome and to gradually eliminate it. Common foods that are particularly high in fibre include fruit, vegetables, and nuts. Of course, some of these things have more fibre in them than others, but ultimately it’s down to the taste of the individual when it comes to which ones they take in. Just opt for high fibre and the problem will begin to melt away. Supplements are also fantastic for helping out the body with strengthening the intestinal walls and the immune system. There are so many products on the market that can’t be listed here, but just some of the important products are outlined below. 1. Pro and Pre-biotic supplements that can help to increase the level of friendly bacteria present in the colon. 2. Peppermint Tea to soothe the digestive system, as well as the rest of the body. 3. Liquorice Root to aid the soothing of the inflamed intestinal walls. This is a guest post by Michael Winicki from Candidafitness.com. If you are also interest to write for HealthResource4u, Please check our guest posting guidelines at write for us.